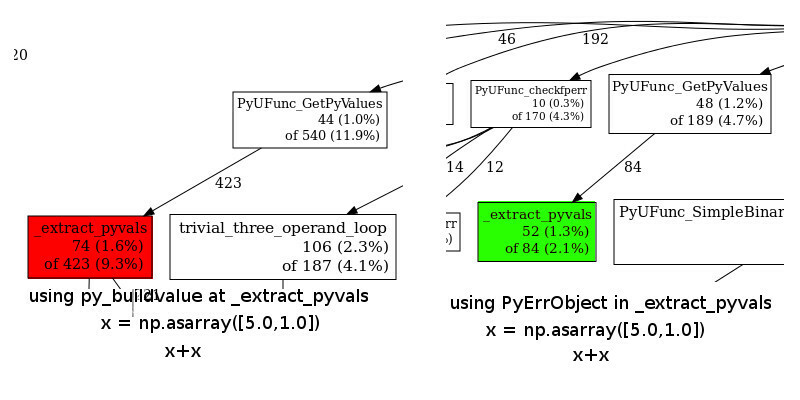 Instead of *errobj = Py_BuildValue("NO", PyBytes_FromString(name), retval); in _extract_pyvals. It alone takes 10% of time, with every operations. Its better to avoid packing of string instead assign pointer to struct and stash them to thread local storage. Hence no allocations would be need to for errorobj every-time, which almost goes unused. Error object include name of ufunc and callback pointer. Time consumption of _extract_pyvals drop to 2% from 9.3%.